The single malt sweet spot. There is not even a freeway off-ramp for the little town of Tomatin. But that’s OK, keeps the city-folk out. Back in the 1970s, this little out-of-the-way hamlet produced more Whisky than any place in Scotland. Well, that’s no longer true, but their Highland single malt is still a core component of many of the finest blends, including two of their own: Antiquary and Talisman. Today, Tomatin is owned by mega-corp Takara Shuzo from Japan, where demand for their products is huge. But they stab off a select amount of their production for their own signature single malt Whisky line across a range of ages and special editions. Tomatin 18 is finished in Spanish Oloroso Sherry casks. And eighteen years is one of those perfect sweet spots in the aging cycle where you get just about as much floral aroma, dense flavor, and complexity as possible while remaining at a reasonable price point. It has plenty of character and richness and was even voted the “Best Highland single malt” in its category in 2014. 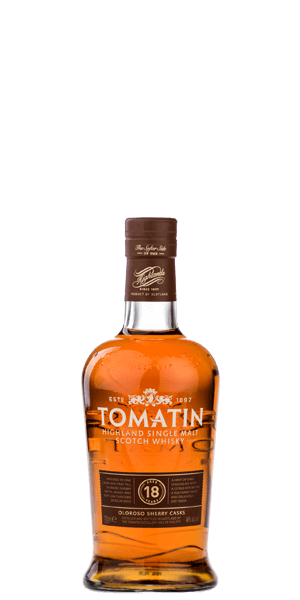 What does Tomatin 18 Year Old taste like? The Flavor Spiral™ shows the most common flavors that you'll taste in Tomatin 18 Year Old and gives you a chance to have a taste of it before actually tasting it. Sultana, fig, pumpkin spices, and a hint of fudge. Granola clusters, orange zest, cocoa, and crisp green apple. Strong and full of wood and cracked pepper. I was very pleased and plan on purchasing more. Smooth and interesting. Description was pretty enticing, so thought I would try a jug... and was very pleasantly surprised. Vanilla, peat, oak... all in there in an extremely workable balance - complex in taste, but simple to appreciate. It's February here, very cold at the moment, and I am really enjoying how it warms my palette and then my throat going down. 3 fingers of this neat in a bucket and sipped whilst watching a ballgame feels pretty decadent. I like it. I notice that the more time you spend with this one, the more you are rewarded. Really complex and smooth, vanilla, dried fruits, a hint of peat, oak and a bit of chocolate. Complex, yet nice notes. Spicy. Great sipping whiskey! Just yes. Nice nose. This plastic nose is quite nice, it is gummy bears smell. Very oaky taste - I like it a lot. Spicy finish, oaky. I can’t find those 18 years, it is not smooth and balanced, but it is interesting and worth a try. Maybe not a whole bottle, miniature will be enough. Ok. Ok. A dash of water makes it much much better. Awesome spirits. Very nice in the end. I believe it is a must have in the bar.